Back in the good old days of slots rather than sockets, CPUs were unfettered and there was no such thing as a locked multiplier. However, since the first Athlon, both Intel and AMD have tended to limit CPU multipliers, using a fully unlocked multiplier as a premium feature of top-end, extremely pricey processors. This changed with AMD's Black Edition range in 2007, which reduced the price premium for a fully unlocked CPU multiplier from hundreds of pounds to around a fiver. Intel has finally responded to this move with its new K-series, two mid-range CPUs that aren't priced at Extreme Edition levels - the i5-655K and the i7-875K. Why the big fuss about unlocked multipliers though? Well, an unlocked multiplier gives you more options when overclocking, as it's the relationship between the multiplier and the Base Clock of the motherboard that governs the overall CPU speed. Therefore, a CPU with an unlocked multiplier can be overclocked by increasing the Base Clock, the multiplier or a combination of both. This can be an advantage over just overclocking the Base Clock, as your motherboard will no longer be a limiting factor in your overclocking efforts. Is it strange that we think CPUs are really quite beautiful? Click to enlarge. The cheaper of the two unlocked Intel chips released is the Core i5-665K (check back next week for our review of the i7-875K), a 3.2GHz dual-core CPU for the LGA1156 socket. 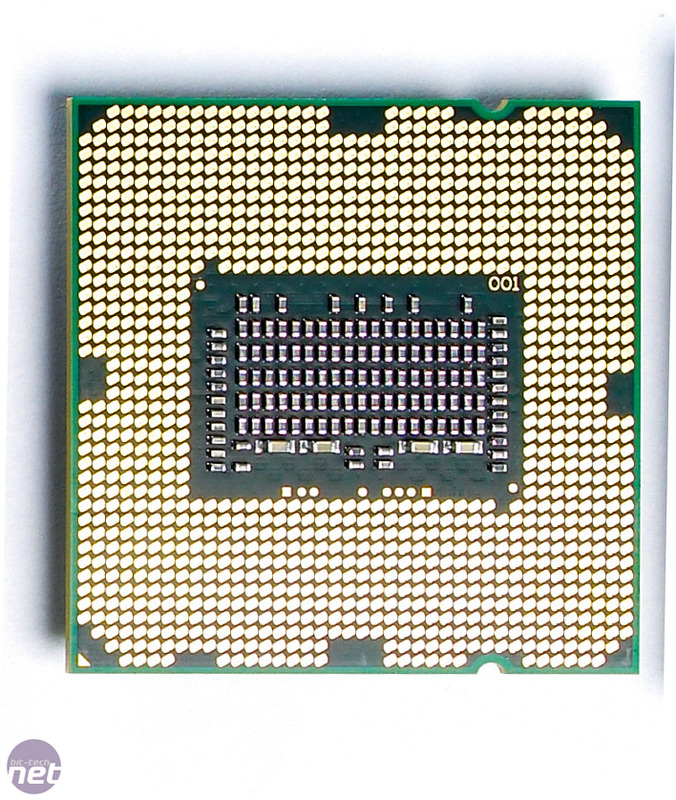 The new CPU is based on the i5-650; indeed the two chips are difficult to tell apart. Both have 4MB of L3 cache and a TDP of 73W, and both support Hyper-Threading and the excellent Turbo Boost (rev 2). The onboard GPU of the two chips are also clocked at the same 733MHz. In fact the only appreciable difference between the i5-655K and the i5-650 is the formers unlocked multiplier and the £33 price premium you pay for it over the i5-650. The i5-650 is however a strange choice for the unlocking treatment, as it actually resides at the bottom end of the Core i5 range of CPUs. Stranger still is the fact that even affordable motherboards such as the Gigabyte GA-H55M-UD2H and GA-P55M-UD2 can overclock most CPUs to their limit using only the Base Clock - we'll be intrigued to find out whether the unlocked multiplier of the i5-655K delivers more overclockability. More interesting is whether the dual-core (though admittedly Hyper-Threaded) £179 i5-655K will match the £155 6-core AMD Phenom II X6 1055T or the £160 quad-core Core i5-750. Only a lunatic would buy an unlocked CPU and run it at stock speeds, so we hammered the delete button and got our hands dirty in the BIOS to see what the i5-655K could do. We ended up with a whopping 1.4GHz overclock, which took the CPU from 3.2GHz to 4.6GHz. 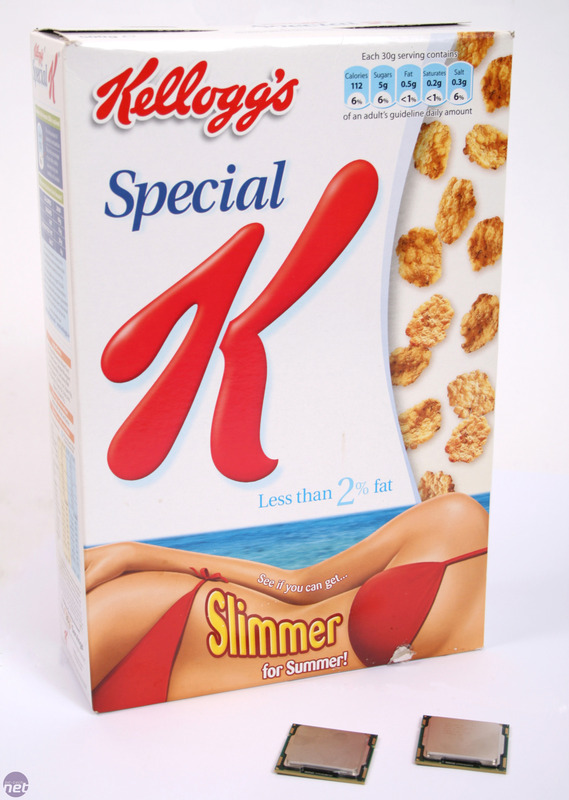 We're determined not to make any Special K jokes anywhere in this review. Click to enlarge. To achieve this, we raised the Base Clock to 200MHz, the vcore to 1.5V, the QPI/VTT to 1.31V and the CPU PLL to 1.9V. We actually lowered the multiplier for this overclock to 23, as we wanted to use a 200MHz Base Clock to increase the memory speed to 1,600MHz, thus maximizing the amount of CPU-to-system bandwidth. As the i5-655K has a relatively high multiplier of 24, and a decent motherboard can apply a Base Clock of 200MHz, there's a theoretical 4.8GHz limit to overclocking before having to increase the multiplier. This theoretical limit is beyond the maximum stable overclock of the sample we tested, so you'll need to use a lot more vcore and exotic cooling to manage it, if at all.